SKU: 69055833025. Categories: All Refill Brush Heads and Accessories, Oral B Replacement Brush Heads. 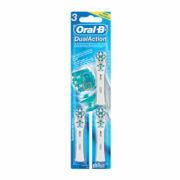 The Oral B Dual Action Brush Head is the perfect companion for your Oral B Rotating Oscillating Electric Toothbrush. Cleaning, freshening and gum care – all in 1 brush. Both heads move for twice the cleaning action for total oral hygiene. Fits all Oral-B Power Toothbrushes (Rechargeable/Battery) except CrossAction Power and Oral-B Sonic Complete. 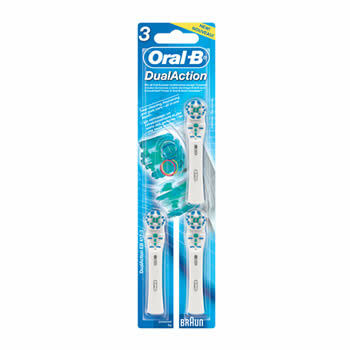 The Oral B Dual Action Brushhead is known for its larger size and its ability to deliver consistent results. A favorite among many, this brush is perfect for those who prefer a brushhead with a bristle area similar in size to a normal toothbrush. Superior Indicator bristles signal brushhead replacement. Cleaning, freshening and gum care – all in 1 brush.